Need to write a thank you note, but have no clue what you’re doing? 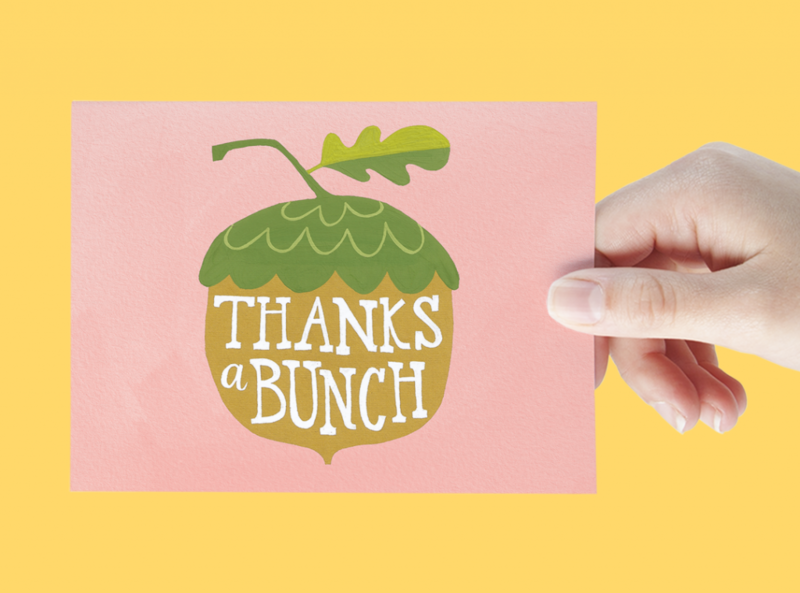 No worries, we’ve got you covered with the most epic guide to how to write a thank you note you’ve ever seen. 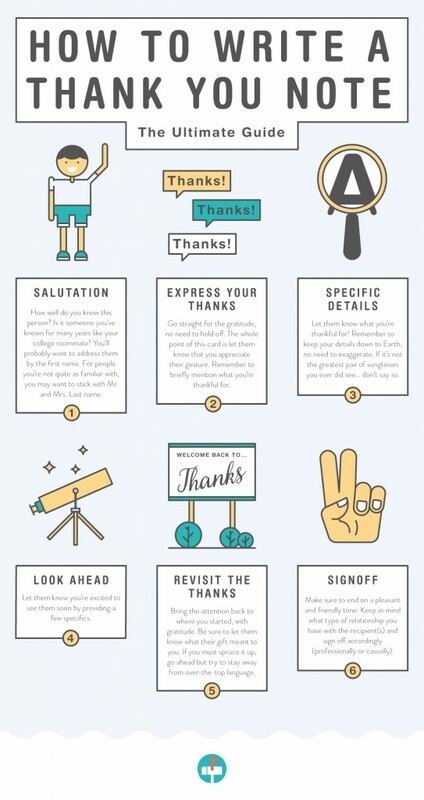 First off, let’s start with the basic anatomy of a thank you note. Use code GUIDE15 for 15% off and send your thank you notes right now. How well do you know this person? Is it someone you’ve known for many years like your college roommate? You’ll probably want to address them by the first name. For people you’re not quite as familiar with, stick to Mr. and Mrs. Last name. Go straight for the gratitude, no need to hold off. The whole point of this card is to let them know that you appreciate their gesture. Remember to briefly mention what you’re thankful for. Your birthday card made my day, thank you so much! Your birthday gift was perfect, thanks for thinking of me. Thanks so much for your generous wedding gift. Thank you for the opportunity to interview for the senior designer position. Let them know what you’re thankful for! Remember to keep your details down to Earth, no need to exaggerate. If it’s not the greatest pair of sunglasses you ever did see… don’t say so. I’m so stoked to use the birthday money on my trip to California next week! I wore your graphic tee today and got a bunch of compliments! We’ve been smoothie-making machines for the past month; we are feeling great. It was really exciting getting to know your organization and learning about the senior designer role. Let them know you’re excited to see them soon by providing a few specifics. I can’t wait to have lunch with you guys next month. I’ll be visiting your neck of the woods in a couple months, can’t wait to come and see you! We’d love to have you over for dinner sometime soon! I am sincerely interested in the position and am looking forward to hearing from you soon. Bring the attention back to where you started, with gratitude. Be sure to let them know what their gift meant to you. It’s ok to spruce it up a bit, but try to stay away from over-the-top language. I can’t believe you remembered my birthday, thanks again! Thanks again for thinking of me, it means so much. We are so grateful for your generosity, thank you for thinking of us. Make sure to end on a pleasant and friendly tone. Keep in mind what type of relationship you have with the recipient(s) and sign off accordingly (professionally or casually). How can I ever thank you for all that you’ve done for our wedding?! You really took the maid of honor role seriously. I’m so glad you were there with me the through the whole planning process, your crazy awesome coordination skills were greatly appreciated! I can’t wait to return the favor next year (eeek). Let’s get the boys together soon. The lovely platter you sent was so incredibly thoughtful, thank you! We actually just hosted our first dinner party last week and I was so excited that I got to use it (it was the perfect addition to our dinner table)! We’re sorry you guys couldn’t make it to the wedding, but we know you were celebrating with us in spirit. Can’t wait to see you guys when we come up for a visit. We were so pleased that you could make it to our wedding! Your generous gift will be put to good use as we work on remodeling our new house and turning it into our home. We’ll never forget those crazy dance moves of yours, thanks so much for coming to the wedding. We’re excited to have ya’ll over for dinner very soon! Thank you so much for being so attentive on our special day and for helping Tom get over feeling so awkward, he had a blast with the bridal photos. You and your team did an extraordinary job making sure no special moment went un-photographed, we can’t wait to see the photos! I was so delighted to see you at my baby shower! Thank you so much for the beautiful bassinet you got for little Marie, it’s already got a place in the nursery. Next time you’re in town, we’d love to have you over for dinner! Hope to see you soon and thanks again for thinking of us. Thank you so much for hosting my baby shower last weekend! The shower was lovely; it was so nice to see all of my friends and family. You have no idea how much I appreciate all of your efforts to make the shower so perfect. Let’s get lunch soon (before I’m no longer able to fit in the doorway :). How in the world do you do this every time? The vintage notebook you got for my birthday was perfect. I was so happy you could make it to my party; I hope you had a great time! Thank you for the incredibly thoughtful gift! It was so awesome to walk into work on my birthday and see all those balloons in my office. It totally made my day! Thank you so much for your thoughtful gifts, you all went totally above and beyond. I’m excited for our company dinner next week, get ready for the best margaritas you’ve ever had! Thanks for coming to my birthday party and for the awesome letter blocks you got me! I love playing with them and mom says I’ll be making real words any day now. I can’t wait to see you when you come visit me next! Thank you for taking the time out to meet with me last week. I really appreciate the opportunity you’ve given my team to present at your next office-wide meeting. I look forward to seeing this new partnership to fruition in the next few months. Thank you so much for coming to my graduation party and your graduation present. I’m so excited to be finished with high school and way more excited to start college next fall! Your generous gift card is going to help me decorate my new dorm room. I’m looking forward to visiting you this summer. I’m so excited to go shopping, thanks again! Use your wedding guest list to make a list of all the wedding thank you notes you’ll need to write. When a gift comes in just write down what each person gave next to his or her name to easily keep track. It’s also a good idea to note down if anyone went out of their way to help you with the big day that may slip your mind when it comes time to write thank yous. Did your high school best friend step in when the wedding coordinator needed help setting up the reception? You’ll want to mention this in your note. Splitting the list up between the bride and groom is the best way to get your wedding thank you notes done on time. Each partner can write to the people they’re closest to and don’t forget to include both names in all the notes (either in the body of the message or signoff). Who to send a wedding thank you note? The folks that gave you an engagement, shower, or wedding gift. Yes, even if you already gave them your heartfelt thank you in person – they should still get a thank you note. They came, they saw, and you got wed. Your friends and family went out of their way to spend your special day with them, don’t forget to thank them. Anyone who hosted a party or shower for you. Hosting is a huge responsibility; consider gifting a little something along with the thank you note. Anyone who helped you through your wedding process. That co-worker who helped you put together the goodie bags for the bridal shower deserves a thank you note. Bridal Party. Your maid of honor kept her cool when you were about to loose yours. Thank her for that. It’s best to write your wedding thank you notes within 3 months of receiving the gift, but better late than never (When to send out other wedding related mail). Your friends and family spent time and probably money on making sure they give you something you’ll like. It’s only right that you spend a little time thanking them in return. Think about setting a daily goal of 4-5 thank you notes. It’s much easier to write a few notes a day rather than a couple hundred six months after the wedding! Ah, the very best friends you and your partner could ever hope for. The Bridal party was there for you from the very beginning (or at least from the point of you asking them to participate). Everything from helping with planning the bachelor weekend getaway to fluffing your wedding dress at the altar; the bridal party has helped make your wedding as special as possible. 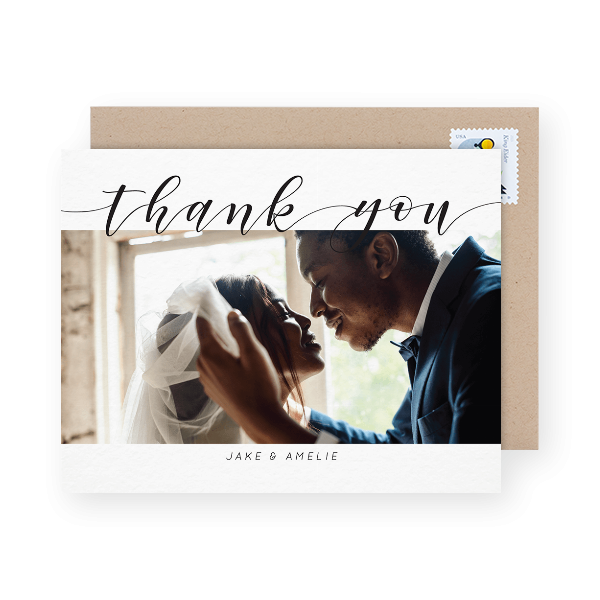 Make sure to take note of their extra special place in your wedding while writing their thank you note. Keep it simple, your bridal party is likely the closest group of friends you and your partner have. Using elaborate fancy language that you wouldn’t normally use in your day to day with these people will make the note seem impersonal and insincere. Keep it simple and honest. Getting cash for your wedding can be super helpful when it comes to funding your dream honeymoon or furnishing your first home. 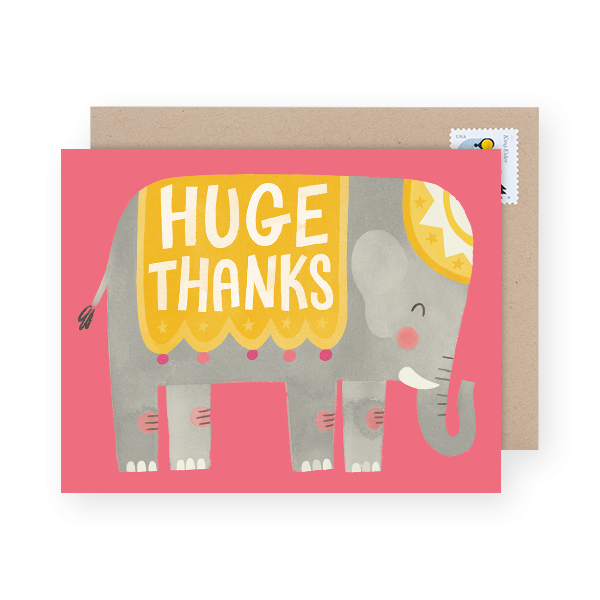 You don’t have to specify the amount of money given in the thank you note, but you should specify what you’ll be using it for. 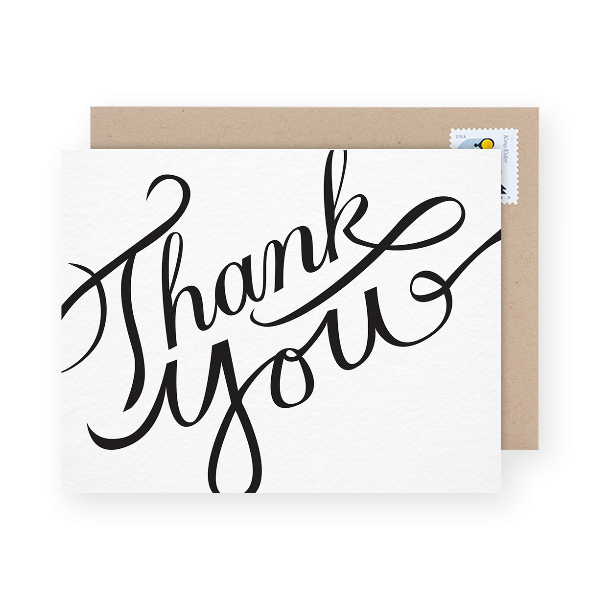 Sure, money was exchanged, but if you were lucky enough to have vendors who made your special day extraordinary why not spend a couple minutes expressing your gratitude? You’ll likely make their day too. Everyone who gave you a gift. If Aunt Judy decided to send you a hand sewn baby blanket all the way from Florida, but wasn’t able to fly up for the shower you should still write a personal thank you. Everyone who attended your baby shower. The baby shower hostess. Your first shower thank you note should be addressed to the hostess. Hosting a shower is no simple gesture. It requires a great deal of time and effort. 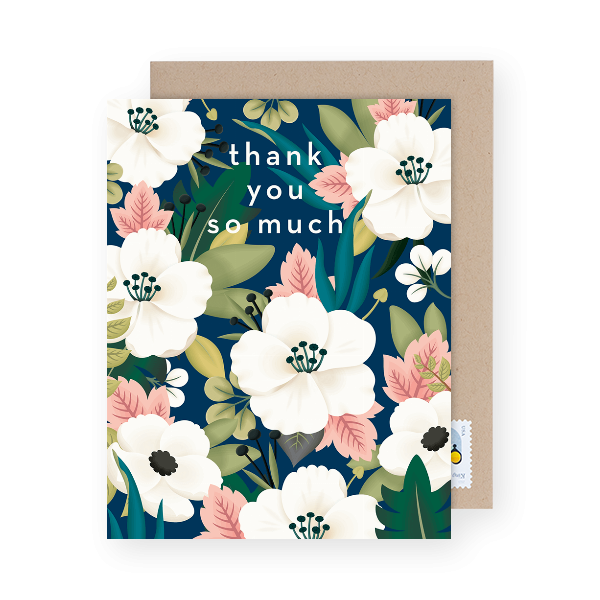 It’s not a terrible idea to also send a small gift as an additional appreciation gesture, but a personal thank you note sent in a timely manner is a must. Anyone who took some time to give you a helping hand. Did your neighbor help carry the groceries inside so you could stay off your feet? How about the impromptu girls night your bestie threw for you so you could get some pampering? Be sure to acknowledge these acts of kindness with a thank you. As with wedding thank you cards, it’s best to try to keep a guest list close by when the gifts are opened so that you can keep track of who gave what. When a gift arrives in the mail, make sure to add to the list as soon as it gets in so that nobody goes un-thanked. Remember to send your baby shower thank you notes in a timely manner. Don’t wait too long or the new baby will definitely delay the thank yous even longer. 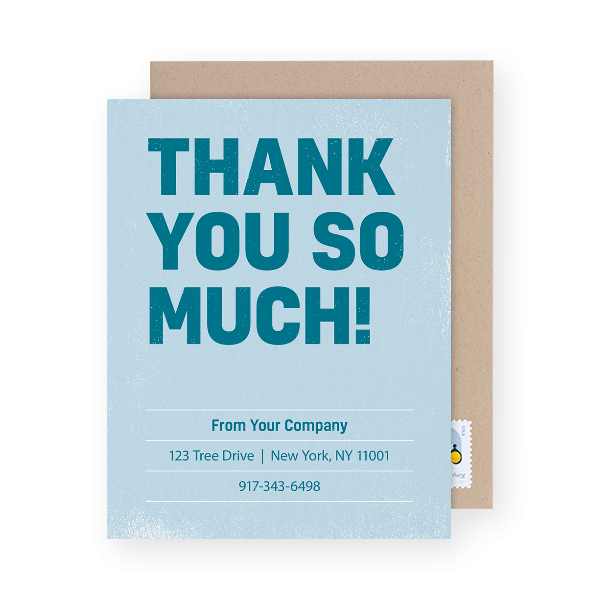 Sending a thank you note to a new client should be a no-brainer. Not only do you want to impress and delight your customers at the beginning of your interaction, but ending on a high note is equally as important. As with any thank you note, make sure it is sent in a timely manner. Graduating is a big milestone in your life that comes with a lot of really awesome presents. 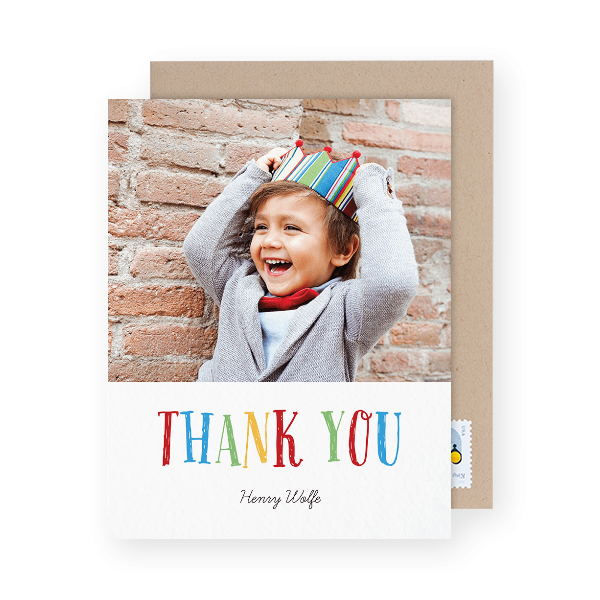 Don’t forget to express your gratitude for all the gifts you’ve received with a personal thank you card. It is not ok to say ‘thanks’ in person or via text and call it a day. For those cash gifts you received in your mailbox, be sure to let them know what the money was spent on – to decorate your new dorm room– this let’s the giver know their cash arrived intact. Anyone who sent you a card/gift. Mom and dad. Surely they helped you get through school in more ways than one. Teachers. Everyone has that one teacher that really made a difference. 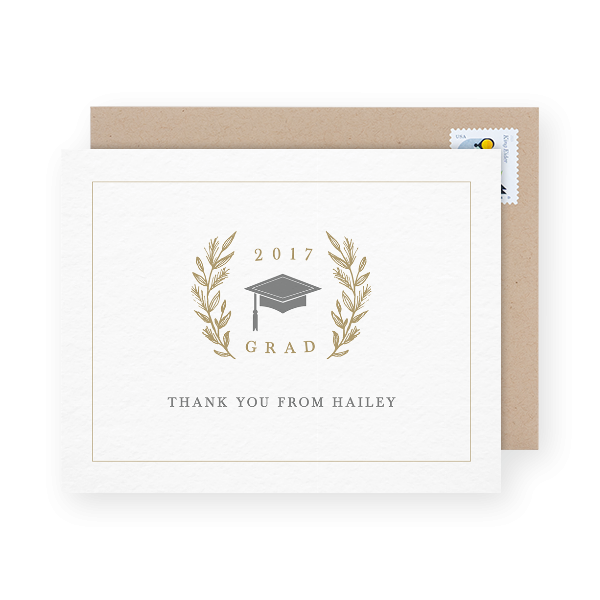 Graduation is the perfect time to reach back out and let them know! Your cousin tutored you in Spanish after your last failed exam. Your neighbors helped you carry your groceries. Your bestie brought you hot soup when you were ill.
There’s really no such thing as a bad time to write someone a thank you note, so why not send one?! Surely the recipient will greatly appreciate the gesture and everyone wins in the end. The best part? 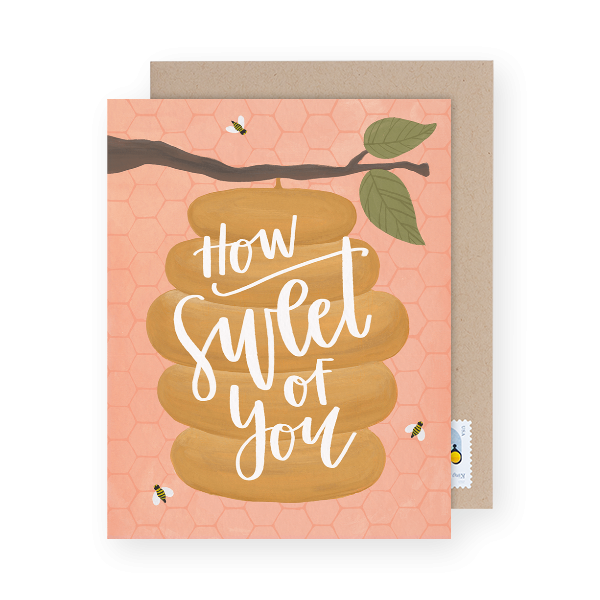 Postable has an insanely beautiful collection of all types of thank you notes for you to write online and click send. 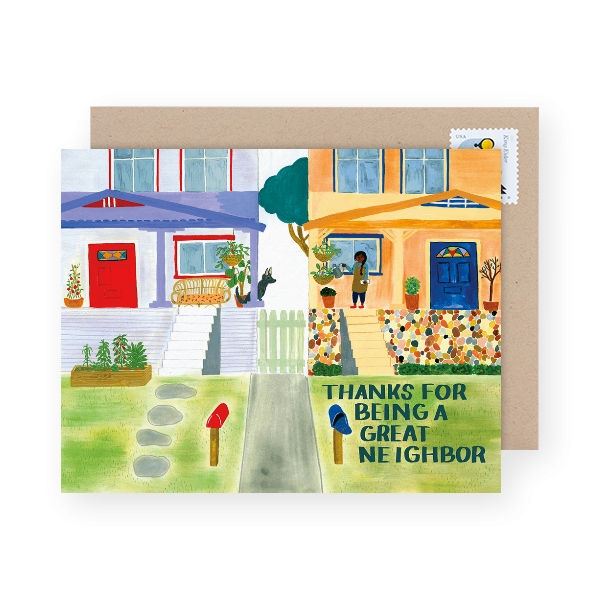 We’ll will print, address and mail the cards out for you. You’re welcome. 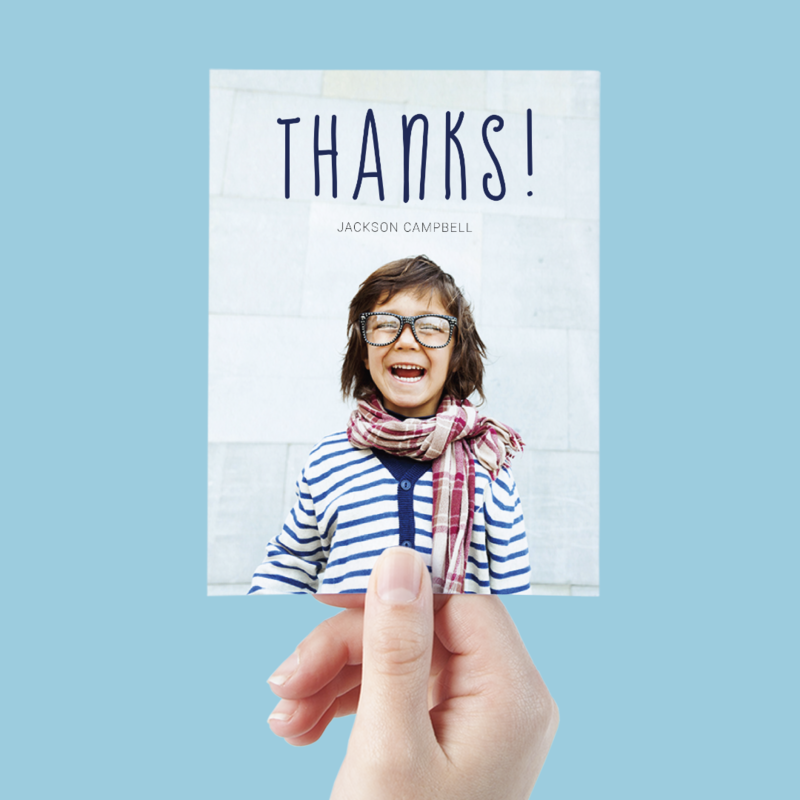 Go ahead, start writing your thank you notes — here.